This study applies theory Channel Expansion Theory to assess factors that influence analyst perceptions of the richness of requirements elicitation techniques. These perceptions of richness are of interest as communication research has shown that richness perceptions are related to selection and effective use of communication channels. 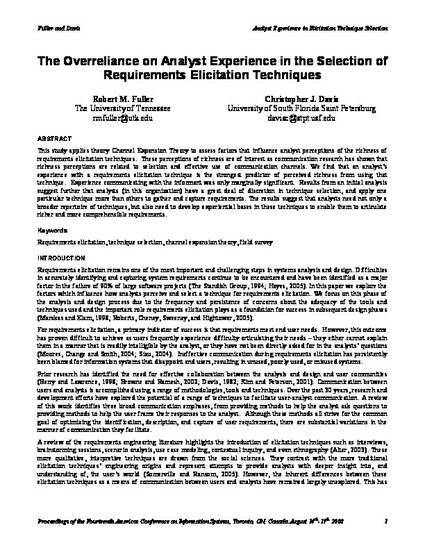 We find that an analyst’s experience with a requirements elicitation technique is the strongest predictor of perceived richness from using that technique. Experience communicating with the informant was only marginally significant. Results from an initial analysis suggest further that analysts (in this organization) have a great deal of discretion in technique selection, and apply one particular technique more than others to gather and capture requirements. The results suggest that analysts need not only a broader repertoire of techniques, but also need to develop experiential bases in these techniques to enable them to articulate richer and more comprehensible requirements.